And what a lovely reinvention it was. This is one that I know a lot of you have seen all over the ‘net but yep, it was MY turn darn it! I’m all for fair play and cool stuff like that. Except in Yahtzee. I’ve been known to turn the die to whatever number I needed when my opponent wasn’t looking. But that will be our little secret, right? That and that I may or may not have added a few extra children pegs once when I played “Life”. Like I of all people needed to add more kids, considering I have six in real life, huh? Like I said, this has been all over the ‘net. But as far as I can tell, the first place it showed up was on the blog Six Sisters Stuff . I love their blog. Good homey food, a close knit family and did I mention the good homey food? So I wanted to give the credit there since theirs was the oldest recipe I could find. I did these almost exactly like theirs with the only change being that I added quite a bit more spice. If you know me, you already knew that was coming though. I about tripled the cinnamon and also added some ginger and cloves to the flour mixture and used butter instead of margarine. I also didn’t chill the dough. Not sure if that was the reason my cookies never flattened out. They stayed in balls. Mind you, they still tasted awesome but they were cakier. Could also be I didn’t measure my flour well enough. Again though, they were still good. I think next time however, I will do these the typical snickerdoodle way and use just baking soda and cream of tartar as the leavening and see if that makes them flatter and chewier. 😀 Most of the dough got frozen to make closer to Christmas so we’ll see if that makes a difference in the final product. 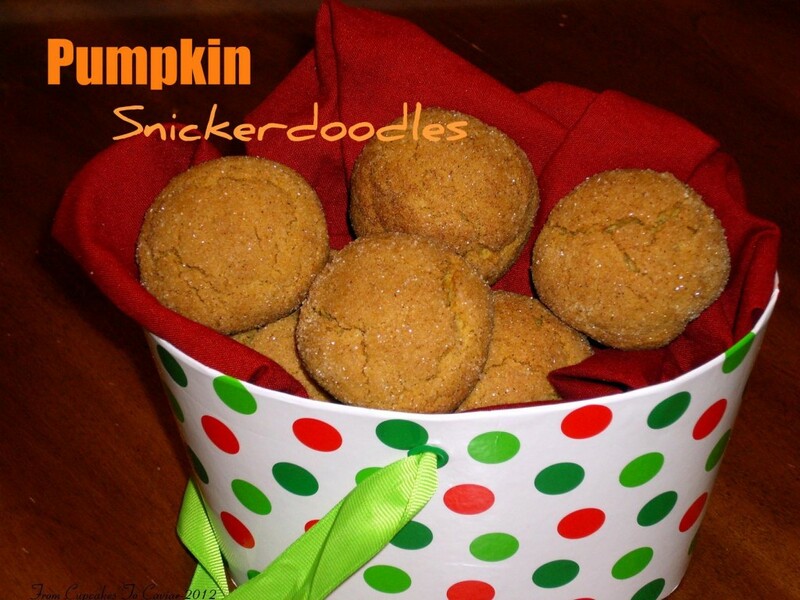 But if you still aren’t ready to give up Pumpkin, this is a good one to try. In a large bowl, mix together the butter, shortening, sugars, pumpkin and egg. Beat until light and fluffy. In a small bowl, combine the dry ingredients and then mix into the wet ones. Beat until well blended. Chill the dough for about 30 minutes, then shape into small balls. Roll the balls in the sugar mix then place on ungreased cookie sheets. Bake at 400 degrees for 7 to 9 minutes, or until light brown and set but not hard. Let cool in pan for a minute or so, then finish cooling on a rack. This entry was posted in Christmas, cookies, Desserts, Easy, Holiday Foods and tagged Christmas, cookies, dessert, easy, holidays by Janet. Bookmark the permalink. Pumpkin just makes everything better. I love this!